WBU Oriole 3-in-1 Feeder My favorite is the unique saucer shaped feeder that offers three ways to attract orioles with nectar, oranges, and jelly. 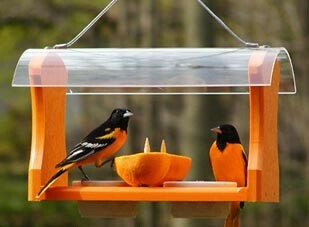 Recycled Oriole Feeder The second most popular feeder is the Poly-lumber feeder made from recycled milk jugs. 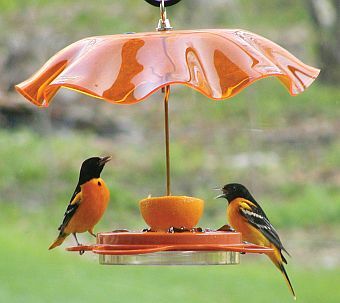 It has lifetime guarantee to never crack, split or fade, stainless steel screws, thick, heavy-duty acrylic roof to allow Orioles to see the food and protects it from rain, and two removable cups to hold grape jelly (Orioles’ favorite jelly flavor) and two pegs for orange halves. The cups also may be used to feed mealworms, peanuts, chopped fruit, suet nuggets, and a variety of other foods. 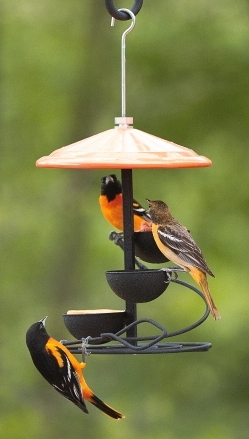 Spiral Three Cup Feeder This is a versatile three-cup feeder with a durable a powder coat finish. You can use the cups for orange halves, chopped fruit, nuts, mealworms, jelly and more. Ring Dish When looking for inexpensive but unique dish feeder, keep this ring design in mind. Versatile enough to fill with an orange, mealworms, jelly, and so much more, this piece fits anywhere and is sure to please the eye. But why just have one dish. You can hook two feeders together or three or as many as you want to build the feeding station that fits your needs!